A Washington, D.C. Metropolitan Area Transit Authority police officer was arrested and charged with “attempting to provide material support” to the Islamic State group, the AP reports. 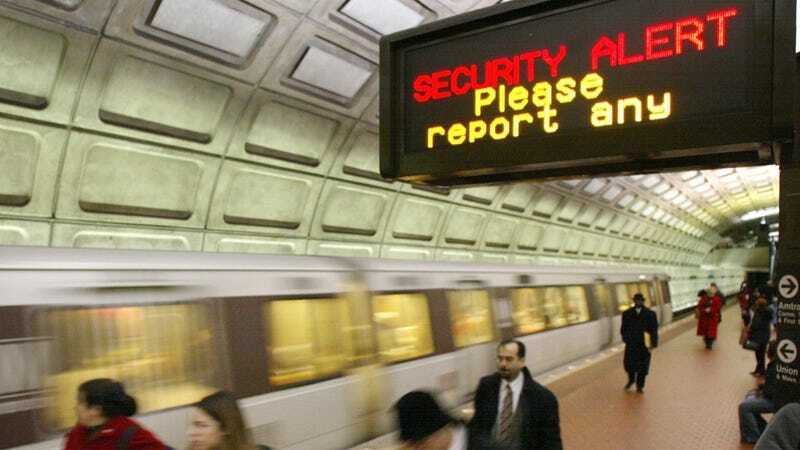 At no time was the D.C. Metro, the capital’s subway system, under threat, according to the FBI. The suspect did, however, buy ISIS a bunch of gift cards for ISIS. On July 28, 2016, [Nicholas] Young sent 22 sixteen digit gift card codes to the FBI undercover with a message that stated: “Respond to verify receipt . . . may not answer depending on when as this device will be destroyed after all are sent to prevent the data being possibly seen on this end in the case of something unfortunate.” The codes were ultimately redeemed by the FBI for $245. Young had been under surveillance since 2010, and he went to Libya twice in 2011 to offer his services to rebels trying to oust then-dictator Moammar Gadhafi, according to the AP. The D.C. Metro is the second-busiest subway system in the United States, after the New York City subway. More than 200 million trips were undertaken by passengers in 2015.